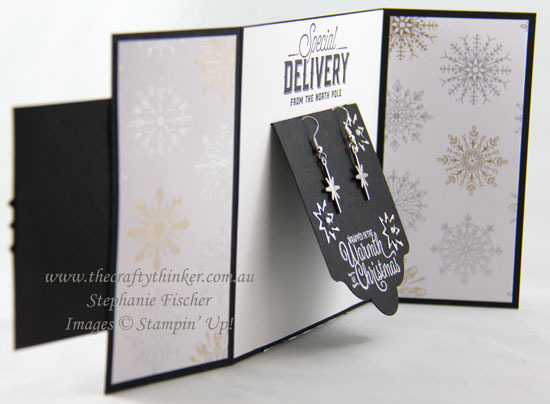 Welcome to the Crazy Crafters' Blog Hop with our Special Guest stamper, Sarah Fleming - we are thrilled to have Sarah join us this month and so excited to CASE (Copy And Selectively Edit) any project that has been created by her . The simple colour scheme and layout of this card really appealed to me and so this is the card I've chosen to CASE (Copy And Selectively Edit). Although, in my hands, the pleasing simplicity has all but disappeared - this card has a little secret! 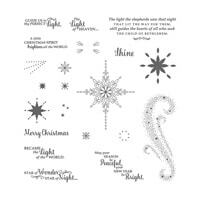 I used silver heat embossing instead of clear and randomly placed small stars from the Star of Light stamp set over the front of this Gate Fold card. The front of this project looks like a normal gate fold card ... but there's a little surprise inside! 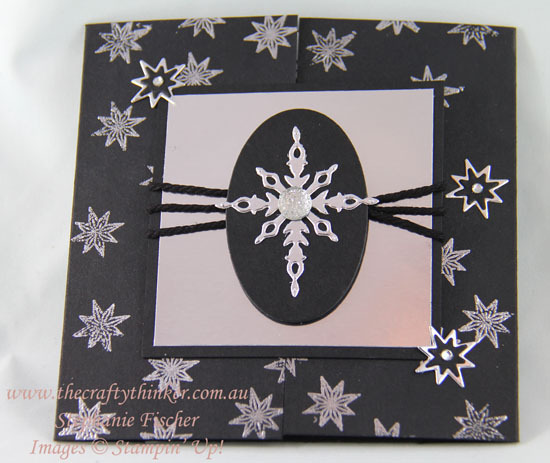 I wrapped Solid Bakers Twine around the centre panel of Silver Foil Sheet and Basic Black cardstock. (I only had white twine, so I died it black with Basic Black reinker mixed with a little water.) 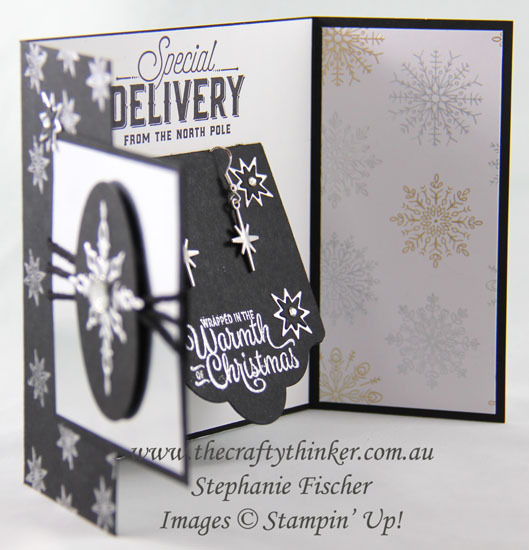 I then added another Basic Black panel to the back to keep the inside of the card looking clean and tidy. This panel is adhered to only the left side of the card. To this panel I added the black oval and Silver Foil element cut with the Starlight dies. 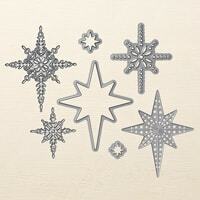 I made some more little decorations with the Starlight dies and glued them to the card front. One of them is glued only at the bottom so that it can hold the card closed. Now for the secret! The card is hiding a gift. 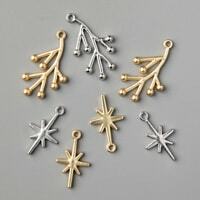 The inside of the card is designed to hold and display a pair of earrings - in this case a pair that I made using the Year of Cheer Embellishments. 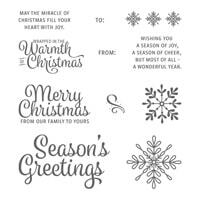 The side panels are decorated with Year of Cheer Specialty Designer Series Paper and the greetings are from the Merry Little Labels and Snowflake Sentiments stamp sets. 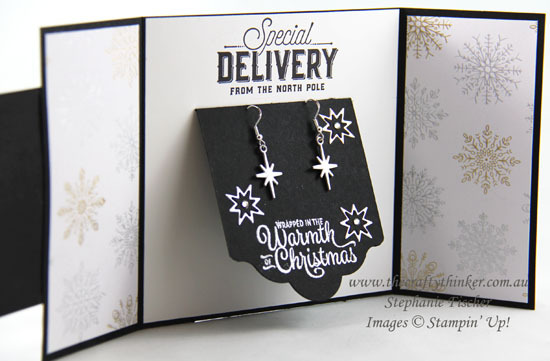 The greeting on the earring holder is silver heat embossed and I've added some more of the little star decorations that I used on the front of the card. 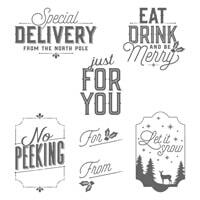 Tomorrow I'll be sharing a variation on this theme that will include a tutorial.